Thursday, June 5th was Addy's Girl Scout bridging ceremony. 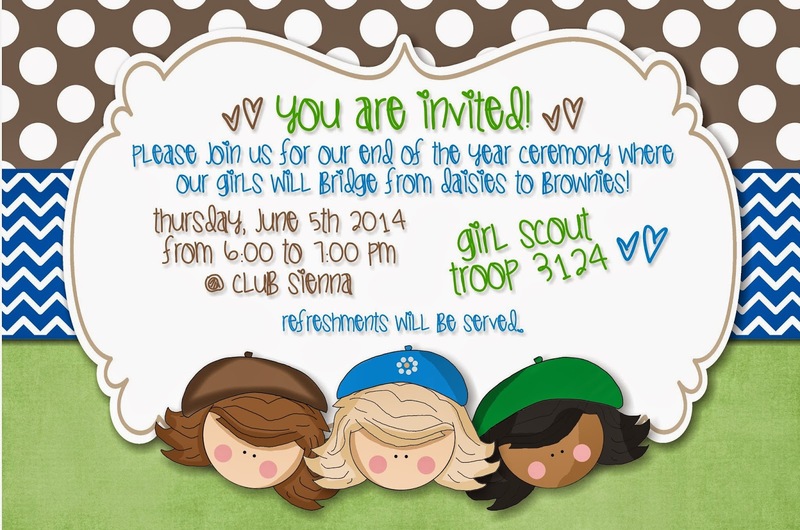 Bridging is where the girls progress from one level of Girl Scouts to another. 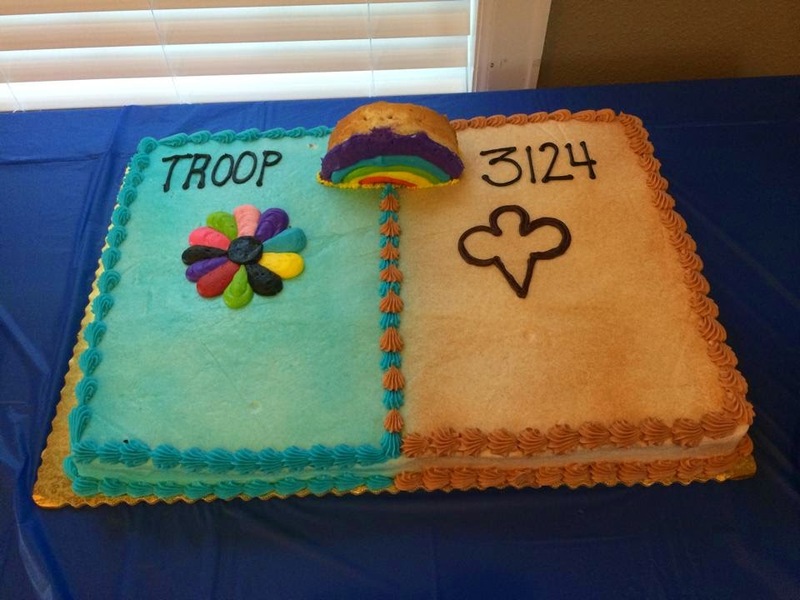 In Addy & her troop's case, they went from being Daisies to being Brownies. We began the event with a traditional Girl Scout flag ceremony. Addy was part of the flag guard & carried the US flag. After the flag ceremony, I shared with everyone what our girls have done as Girl Scouts over the past 2 years. And then it was time for the actual bridging! 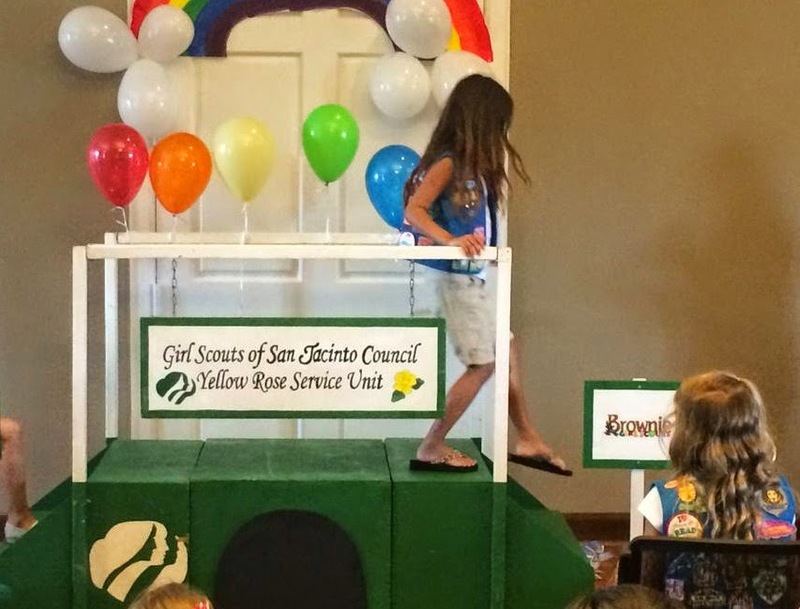 One at a time, the girls crossed over the Yellow Rose Community Girl Scout bridge & became a Brownie scout! Here is Addy as she is crossing the bridge. After all the girls had crossed the bridge, they came together as a troop & sang a couple of songs & a few of the girls recited a poem. And then it was time to eat cake! I'm so proud of Addy & her sister scouts for their hard work & dedication to being wonderful Girl Scouts! They accomplished so much in just 2 short years. I can't wait to see what they will do as Brownies! 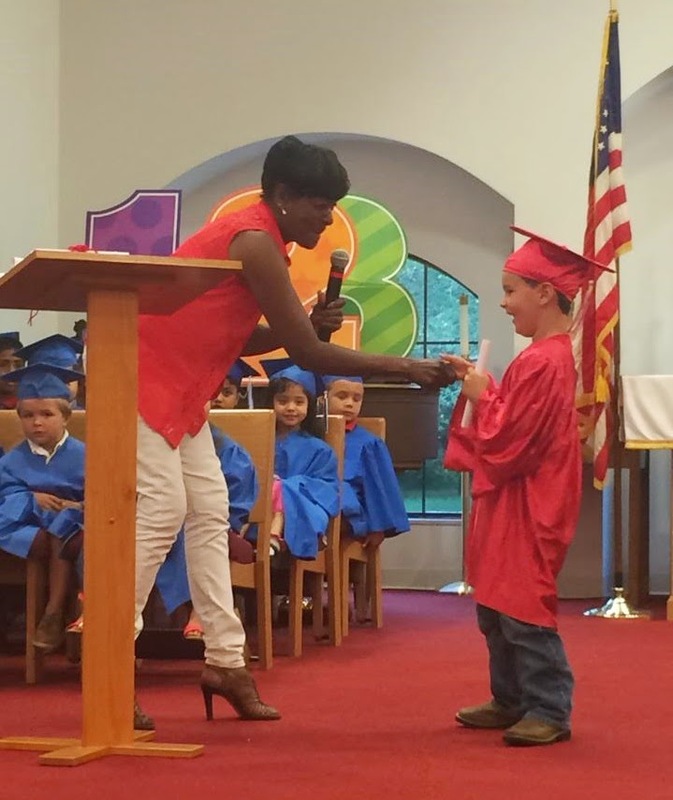 Alex graduated from Pre K on Thursday, May 29th. It was absolutely the cutest ceremony ever! The program opened with the kids from all 4 classes singing 'In the Beginning,' a really sweet song about the story of creation. After that, the 2 year old & the 3 year old classes both sang a couple of songs. And then it was time for the Mustangs performance! They started with Mi Familia. And then recited a poem called 'Kindergarten, Here We Come!" A-Man held the E & did a super job! After Alex's class finished their part, the bridge class sang a few songs. 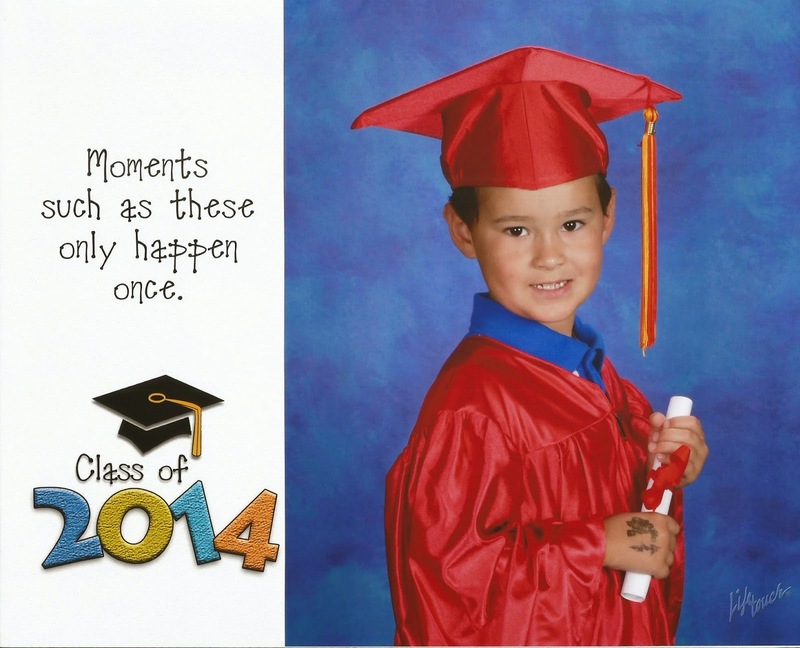 And then it was time to graduate from PreK! Alex had such a great year in PreK. He had 2 terrific teachers that he is going to miss so much next year. And he made lots of sweet friends! Way to go sweet boy! Mommy & Daddy are so proud of you! Addy had her first grade awards on May 29th, which was one week before school got out for the summer. which was voted on by her class! Do you all understand the awesomeness of this??? My sweet girl with ASD with 'delays in social skills' was voted the friendliest girl in her class by her classmates! which was given to her by her art teacher. And after she got her awards, she had to tell a quick joke while she had everyone's attention. Silly girl! One week later, on June 5th, Addy's class had a talent show. Addy was the opening act, The Comedy Kid. Boy, did she do awesome! All this from a girl who was hardly speaking just 3 short years ago! And now she's a regular little comedian. I sure am one proud momma! Alex's Field Day was Friday, May 23rd, which was the same day as Addy's. Matter of fact, Addy's Field Day ended at 9:30 & Alex's started at 9:45. Thank goodness their schools are just a couple of miles apart. Nick took the morning off of work for a special dad event at Alex's Field Day. That event was the Dad Dash & it was the official start of Field Day! For the Dad Dash, the kids & their dads ran a short race, probably about 50 yards. Looks like Alex took off without his dad though, lol! All the kids got medals but Alex was honestly the first one to cross the finish line! After the run, they had a sack race & a tug of war competition. But for some reason, Alex did not want to participate in either of those events. I'm not sure what was going on. He might have just been being shy since there were parents there, or he & his best friend had gotten into a 'fight' the day before & weren't getting along, or a girl in his class had said that she won the dad race & that could have upset him. (Because he's just a little competitive, lol!) I really don't know what it was. When I asked him he said he didn't want to do those events because he's "not very good at them." After that, the kids had snack. And then immediately following snack, they had popcorn & snow cones! And then they got to ride this super cool train! Alex's field day was an all day event but Nick & I couldn't stay all day long. So we left after Alex rode the train. When I picked him up at the end of the day, Alex said that they had also jumped in a bouncy house, played with water guns & gone on a giant blow up water slide! Every year, SOE has a big Tug of War competition & of course, Field Day. This year Tug of War was on May 2nd. Mrs. Lowe's class fought hard & came in 6th place! Field Day was 3 weeks later, on Friday, May 23rd. Their field day does not have races & ribbons like your old school field day, it's more like a carnival. and a giant blow up slide! From the look of it, I'm pretty sure Addy & all her classmates had a really fun time during Field Day! 2 years ago we signed Alex up for t ball, but after the first game he was done. And then last year I signed him up for the sports skills class at The Little Gym. Most days though, he wouldn't even go in the gym & on the days that he did, all he would do is sit on the side & watch. So when his school sent home a flyer for Soccer Shots, a soccer club that would be coming to his school, I thought that this just might be the perfect opportunity to try to get him interested in a sport. So I signed him up! Every Wednesday morning for 9 weeks, his Soccer Shots coach, Coach Lindsay, would come to St. Catherine's. The class had about 15 kids in it & lasted about 45 minutes. On the last class day, parents were invited to watch as the kids showed off all the skills that they had learned. They started the class with an opening circle where they discussed the word of the week. Then they ran a little to warm up. Look at Alex, he's raring to go! Then they demonstrated their ball handling skills. Look at this hot & sweaty kid! When they were all done, they came together for a closing huddle. And got Soccer Shots All Stars certificates! I'm really glad that I signed Alex up for this program because he loved it! It really peaked his interest in soccer & because of that, I've signed him up for a Houston Dynamos soccer camp this summer. Looks like we might have a future soccer star on our hands! Because don't forget... "He's pretty good at this stuff!" For the 2nd year in a row, Addy played Spring baseball. 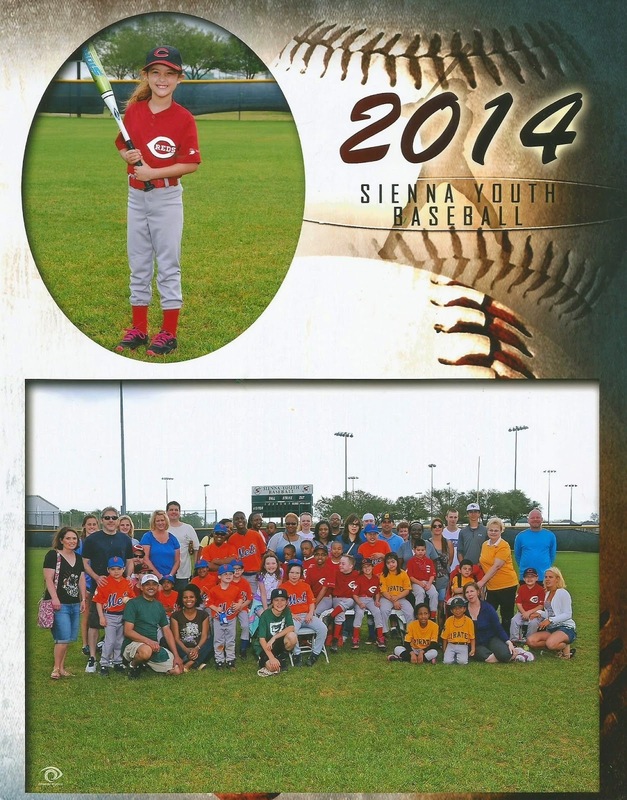 She played in the Sienna Dream Team league and she was on The Reds. She's got the bat throwing down, lol! Here she is with her sweet friend & teammate Norah. On the day they took pictures, Addy loved it. She was so excited for the group picture that she was the very first one on the bench! And then she ran to the photographer & asked to see the photos he had taken. The last game of the season was on May 10th. There were donuts before the game, pizza afterwards, music & lots of fun! And some of the teachers & aides from the resource department at SOE came out to watch her & her friends play ball! Addy had another great baseball season & I know she is looking forward to playing again next Spring.